Dinner on our first night in Kyoto was on of my favourite meals during our two weeks in Japan last year. Before we went on holiday Becks bought me a copy of Rice, Noodle, Fish, a book about the food culture and unique dining experiences of Japan. One of my memories from the book is the stories of small restaurants run by individuals striving to be the best they they can. They frequently only serve one dish and spend their careers perfecting their craft. Dinner that night in Kyoto felt like one of those places. The small restaurant only sat 8-10 people along a single counter and was run by a friendly man who took our order, served us drinks and most importantly cooked for us. He only cooked two things, noodles and tempura. I ordered the curried udon noodles. 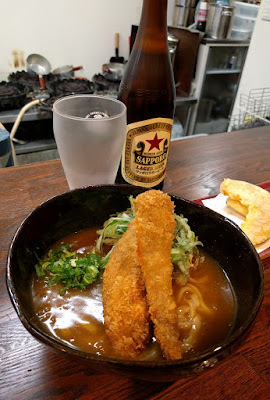 The handmade noodles still had a touch of bite and the curry sauce was the perfect consistency to coat them on their way into my mouth! I really enjoyed the balance and subtly of the curry sauce. 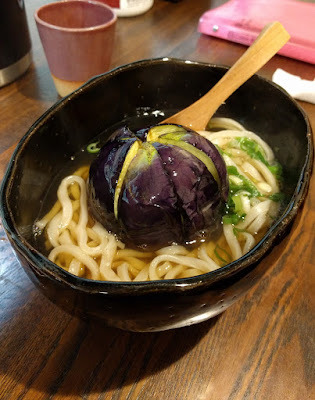 Becks ordered the aubergine noodles which slightly to my surprise came served as a whole deep fried aubergine. Everything came served in some beautiful hand made pottery. While we were eating a few locals popped in and out for a bowl of noodles. Another person bought in a friend to watch them eat a bowl of noodles. I couldn't understand what they were saying, but I got the impression that they were getting their friend to try a favourite place. 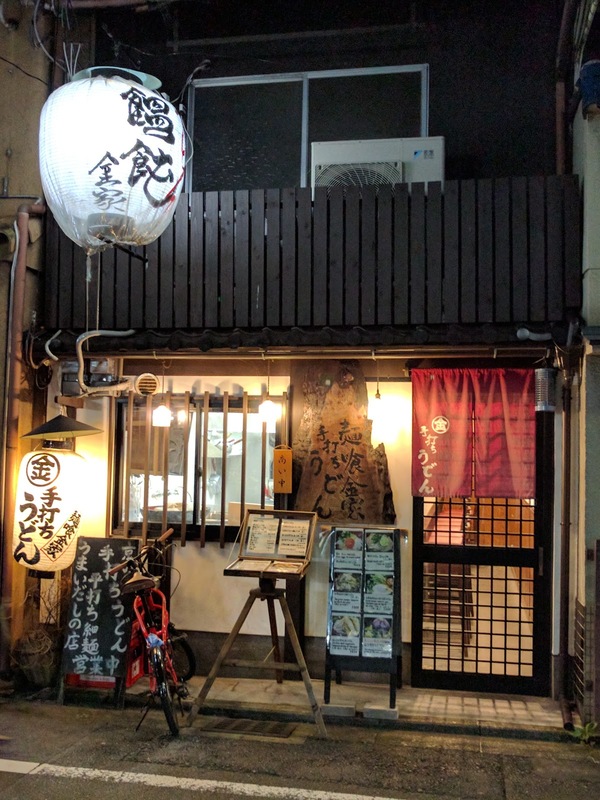 More than just the food that night, which was good, it felt like we'd had a cultural experience and were starting to get under the skin of Japan a tiny bit.